If you can see by simply slipping on a pair of glasses, or if you don’t need glasses or contact lenses at all, the gift of sight is something we can easily take for granted. For millions of people worldwide who are affected by corneal eye disease or corneal damage, they see darkness where others see light. Cornea and eye donation is the first step in the cornea transplant process. A cornea transplant is a surgical procedure where surgeons implant the cornea from a deceased donor into a recipient who has corneal blindness. This surgery helps restore vision in someone who has lost the gift of sight. Over 95 percent of corneal transplant surgeries successfully restore the recipient’s vision. 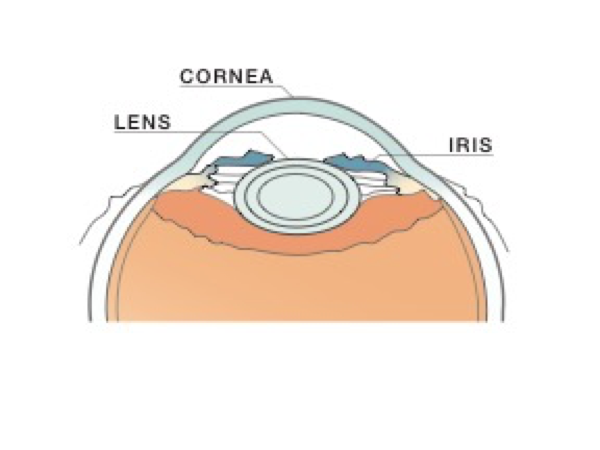 The cornea is the clear, dome-shaped surface of the front of your eye. 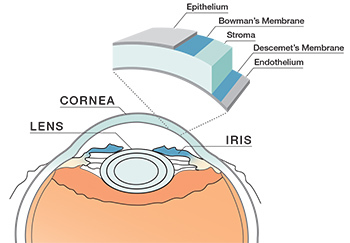 The cornea makes up approximately two-thirds of your eye’s total optical power. It also helps protect your eyes from dust, germs, and foreign particles. Corneal blindness can be caused by either a corneal disease or a corneal injury. When a person suffers from corneal blindness, their vision is significantly impaired and many are not able to accomplish many simple day-to-day tasks. Keratoconus causes a steep curving of the cornea that causes visual distortion (or changes to your vision). These include: ghosting, multiple images, glare, halos, and starburst. Researchers estimate that 1 out of 2000 people have keratoconus. Fuchs’ Dystrophy occurs when the endothelial cells (cells that make up the endothelium seen in the diagram to the right) slowly deteriorate. This causes someone to experience glare and sensitivity to light, eye pain, halos, and difficulty seeing at night. What is Having Corneal Blindness Like?